When you walk into the Center Stage for Boston Conservatory’s Hydrogen Jukebox (music by Philip Glass on texts by Allen Ginsberg) you see a large American flag on a scrim flanked by two video screens offering a series of historical Qs and As: what is Tenochtitlan, who was Ginberg’s long-time partner, what is Iran-Contra, what is a Sandanista. Early on we see an large upstage array of fluorescent lights in the shape of the flag. Philip Glass is persona non grata to a significant portion of the concert-going audience. I don’t feel that way: I’ve seen Einstein on the Beach twice, I’ve been to Philip Glass Ensemble concerts, I admired Koyannisqatsi and the Kentridge Satyagraha at the Met. However, I’ve also cringed through Songs from Liquid Days and The Voyage, and I sort Glass’ embarrassingly huge oeuvre into two piles: that which explains his influence on modern music history, and the misbegottens. Six singers (on Thursday night Audrey Ballish, Hannah Carlson, Nora Burgard, Willie Casper, Kyle White and Brett Bode) and six musicians (Maggie Nobomuto and Matthew Yamada, woodwinds; James Myers and Kaitlen Barr, keyboards; and John Tyree and James Koo, percussion) worked the show under conductor Ryan Turner. The vocalists sang from memory and performed the stage business provided by director Nathan Troup. One way to understand Glass’s popularity and persistence is to see him as part of a group that saved the cadence from the dustheap of history. A student of Nadia Boulanger, Glass walked away from Western music history to find inspiration in other places, especially in Indian ragas. His early music is fascinated with incremental rhythmic processes. But it wasn’t until after Einstein, which is underpinned with a single extended cadence, that his music found a huge audience. In the loud, amplified wash of the Philip Glass Ensemble, the inherent beauty and power of the simple cadence is magnified (some might say inflated) to heroic proportions. Ginsberg’s poetry wrestles constantly with emotional extremity: “Howl” is the most overt realization of this, but even something like “Aunt Rose,” for all of its nostalgia and quirkiness, stretches taut skin over barely contained emotions: love, loss, shame, anger. Hydrogen Jukebox, from 1990, sets 14 Ginsberg texts over about 75 minutes without any specific dramatic scenario. Typical of Glass, the vocal settings leave the texts alone. The music neither italicizes nor reacts to the words. They are sung at a rate slower than normal speech. There is no obvious reason for one poem to follow another. Glass often collaborates brilliantly: he created powerful works with Robert Wilson and Errol Morris and Godfrey Reggio. It is no surprise that his music is frequently used for dance, whether specifically written for it or not. The relentless focus on repetition and the static nature of any single piece of his opens up room for others to respond. Or, if you’re feeling less generous, you might say that most of the time Glass’s music is incomplete, requiring some additive to justify your attention. Troup is a talented constructor of stage pictures: he gave us many moments where one could imagine the gorgeous production still might emerge. But this show does not have a light touch: when lightning is mentioned in the text, strobes go off to demonstrate. When a typewriter is mentioned, a typewriter appears on stage. 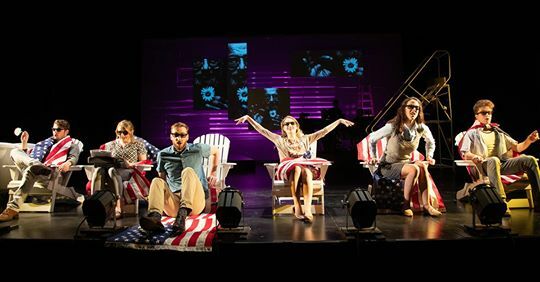 An image of spectators at an early nuclear blast, reclining in Adirondack-style chairs and wearing sunglasses, is meant to haunt several of the scenes, and just to be sure we get it, images of bomb explosions are projected. During “Aunt Rose,” a faceless figure dressed all in black lace with an impossibly long train slowly, slowly limps across the stage, like a refugee from an unproduced Robert Wilson production. Six American flags come in for some mild abuse: they’re used as towels, as seatbelts. Later, though, the cast all genuflects in front of one, holding hands in solidarity, though in solidarity with what I cannot say. During a poem about Iran-Contra, we get videos of Oliver North. That scene starts with videos of Nixon and Kennedy and ends with Trump and Clinton, so we are sure to get it, that politics has always been dirty. The production wants to be “radical,” like Ginsberg was radical, but neither the music nor the poems nor the staging rise above any but the shallowest of signalling. The most radical thing that could have happened in this show would have been for an audience member to rise and complain about the use of the flag spread out on the floor as a beach towel: but we all sat silently and eventually it was over. Glass’s music is cool: even at its most frenetic, the surface quickly establishes itself and the only changes are those implied by the harmonic cycle over which all of the activity swirls. Once one absorbs the nature of the energy in any one piece, one can just stop and feel it go on around you. Troup does his best to connect the oddly paired aesthetics of Glass’s cool and Ginsberg’s heat. Glass may think he is “respecting the music that [is] already in the words,” as a quote in Troup’s Director’s Note has it, but most of the time it seems like criminal neglect. The passionate, repressed swerves in “Aunt Rose” are ironed out and flattened and the awkward scene of intimacy recounted. “You powdered my thighs with calamine” becomes unintentionally funny. “Howl” is one long po-faced embarassment: Troup may have created some of his on-the-nose staging moments in emulation of Glass who has the saxophone, yes, howl during the movement. Glass’s bizarre alchemy makes “Aunt Rose” stupidly comic and “Howl” so stentorian that the invocations to Moloch have no quiddity at all. “Moloch in whom I sit lonely! Moloch in whom I dream Angels! Crazy in Moloch! Cocksucker Moloch!” It takes some doing to reduce that to nothing. In the vocal works of Glass that I admire, he sets either meaningless texts or dead languages. I treasure the Knee Play in Einstein where numbers and solfege syllables are as interesting as any text, the solfege in particular helping to generate a sussurus of gentle calm. I sat through Hydrogen Jukebox in astonishment, wondering how the composer could ever have thought he had the tools to present these poems. Glass’s fecundidy comes with an aspect of sloppiness. Perhaps it is just a bull-headed willingness to do anything, so long as he does it the way he always does everything, and he just doesn’t worry too much about whether it actually works. Glass’s music demands rock-solid metronomic rhythm, especially when the meters become asymmetric. The Conservatory band and Turner got things right for the most part, but several times Thursday night, not everything locked in place, and the music doesn’t tolerate much imprecision: one’s attention jumps immediately into any breach. Hydrogen Jukebox is a misbegotten. It fails as a history lesson, it fails as setting of texts. However, I found the ending unexpectedly heartbreaking. “Father Death Blues,” set to a triple-time melody that sounds like a folk song, is textured like a chorale. The performers produced beautiful, mostly conventional harmonies, but with a few interesting twists. The density varies from stanza to stanza: all are singing, then suddenly voices drop out and perhaps only one is left to finish a phrase; then the next stanza begins. It felt like an ending, a summing up, but of what? Though the music was unrelated to what had come before, it served up a mystifying coup de theatre: a touching moment dropped in from somewhere far away. Then, the final tableau: as “Father Death Blues” ends the Adirondack chairs are set up again, the performers sit in them, turning their backs to the audience; they put on their shades, needed perhaps because our future is so bright as to demand them? The big fluorescent American flag flickers on, a metaphorical hydrogen bomb of nationality, exploding in silence, curiously unmoving, then all goes black. The run continues through Sunday. That about sums up my Thursday night impression as well, largely in accord with this wonderfully informed and even-handed review. I would just add ‘For PO’ as another mildly affecting moment. A Glass ‘misbegotten’? Surely, although I find it refreshing – if not always enlightening – to hear Allen Ginsberg’s razor-sharp riffs leap off the page into song, however poorly set. I attended the Saturday performance; I was surprised the auditorium/performance space was nearly filled. Thru lack of sleep I may have slept thru part of it but what I remembered made me want to try more Carter, -er- Philip, Glass. I agree with the reviewer on how the performance was done: worth going to, but I also did the Scarlatti opera concert the next afternoon. As for Hydrogen, it is a Period Piece, something worth knowing as an example of its time which culminated with a SCOTUS decision saying it’s OK to desecrate the American Flag. In short, late 20th-century Anti-Americanism Progressive Radicalism in full flower; fortunately without 12-tone Serialist drivel. 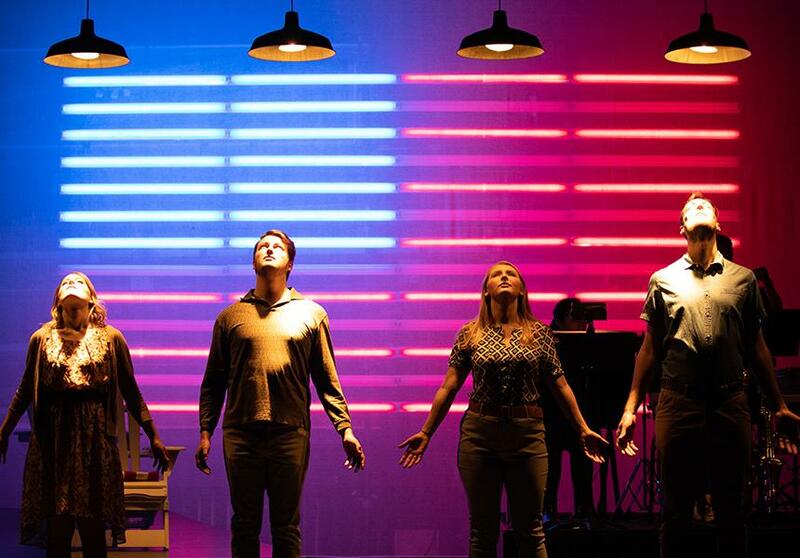 The BosCon students were attracted in the Age of Trump by the piece’s Anti-Americanism and the staging would have been right at home in 1988 and got to re-use florescent lights from earlier productions. Be thankful Philip Glass is not Milton Babbitt or Julian Grant. As for Ginsberg’s poetry, my problem is the son of one of the Beat Poets/Radicals, either Ginsberg or Abbie Hoffman, built a set of kitchen cabinets of clever design for my former girlfriend’s kitchen. He never finished the work; last I knew she still uses them. That fact was going thru the back of my mind all during the performance. For the Record, Ginsberg worked as a cook on the liberty ship SS JAGGER SEAM AFTER that boat struck and demolished the Hackensack River Draw on the CNJ’s Newark-Jersey City line. For a different Period Piece and Understanding, go to the BosCon’s The Consul next month and don’t miss Paride ed Elena (Paris and Helen, I saw it 2/15) at Odyssey Opera this Sunday.